The U.S. Embassy in Riyadh celebrated America’s Day of Independence last night at the residence of the U.S. Ambassador, with hundreds of Americans and Saudis attending the 4th of July event which is usually celebrated by the Embassy in Riyadh early in the Spring for weather considerations. This year marks the 235th anniversary of America’s independence in 1776. Read more here. Members of the U.S. Air Forces Central’s band, Wild Blue Country, stand with the U.S. Ambassador to the Kingdom of Saudi Arabia, Mr. James Smith and his wife Dr. Breslin-Smith after the National Day Celebration which hosted over 1,000 dignitaries from around the world. 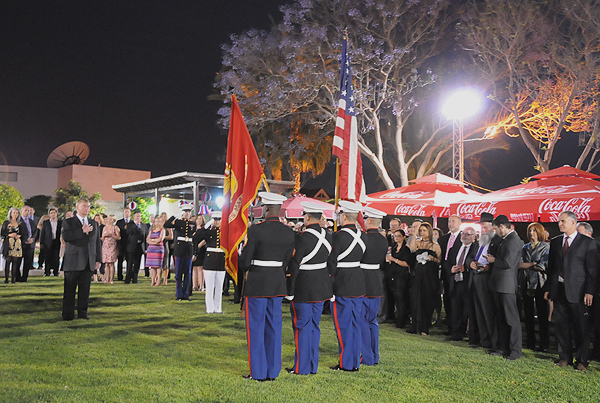 US Embassy Cyprus posted online: “We would like to thank all the sponsors of the National Day Reception.” The event was made possible through the generous sponsorship of local U.S. companies and affiliates. La embajada de Estados Unidos en Uruguay realizó una recepción en la residencia oficial con motivo de celebrarse el 235 aniversario de la independencia de Estados Unidos. Ryan C. Crocker, of Washington, Personal Rank of Career Ambassador, to be Ambassador Extraordinary and Plenipotentiary of the United States of America to the Islamic Republic of Afghanistan. Anne W. Patterson, of Virginia, a Career Member of the Senior Foreign Service, Personal Rank of Career Ambassador, to be Ambassador Extraordinary and Plenipotentiary of the United States of America to the Arab Republic of Egypt. Lewis Alan Lukens, of Virginia, a Career Member of the Senior Foreign Service, Class of Counselor, to be Ambassador Extraordinary and Plenipotentiary of the United States of America to the Republic of Senegal, and to serve concurrently and without additional compensation as Ambassador Extraordinary and Plenipotentiary of the United States of America to the Republic of Guinea-Bissau. Kenneth J. Fairfax, of Kentucky, a Career Member of the Senior Foreign Service, Class of Minister-Counselor, to be Ambassador Extraordinary and Plenipotentiary of the United States of America to the Republic of Kazakhstan. D. Brent Hardt, of Florida, a Career Member of the Senior Foreign Service, Class of Counselor, to be Ambassador Extraordinary and Plenipotentiary of the United States of America to the Co-operative Republic of Guyana. Donald W. Koran, of California, a Career Member of the Senior Foreign Service, Class of Counselor, to be Ambassador Extraordinary and Plenipotentiary of the United States of America to the Republic of Rwanda. Geeta Pasi, of New York, a Career Member of the Senior Foreign Service, Class of Counselor, to be Ambassador Extraordinary and Plenipotentiary of the United States of America to the Republic of Djibouti. James Harold Thessin, of Virginia, a Career Member of the Senior Executive Service, to be Ambassador Extraordinary and Plenipotentiary of the United States of America to the Republic of Paraguay. Michael H. Corbin, of California, a Career Member of the Senior Foreign Service, Class of Minister-Counselor, to be Ambassador Extraordinary and Plenipotentiary of the United States of America to the United Arab Emirates. Jeanine E. Jackson, of Wyoming, a Career Member of the Senior Foreign Service, Class of Minister-Counselor, to be Ambassador Extraordinary and Plenipotentiary of the United States of America to the Republic of Malawi. Matthew H. Tueller, of Utah, a Career Member of the Senior Foreign Service, Class of Minister-Counselor, to be Ambassador Extraordinary and Plenipotentiary of the United States of America to the State of Kuwait. Susan Laila Ziadeh, of Washington, a Career Member of the Senior Foreign Service, Class of Counselor, to be Ambassador Extraordinary and Plenipotentiary of the United States of America to the State of Qatar. Ariel Pablos-Mendez, of New York, to be an Assistant Administrator of the United States Agency for International Development.